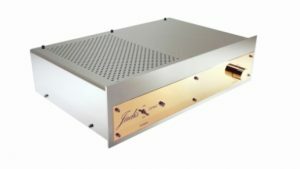 The new Jadis PA100 is a stereo power amplifier that uses 12 power tubes. It produces a total power output of 150W in AB class. At the first sight one can see that this power amplifier is definitely from the Jadis’ line of products. Golden front plate, high quality chassis, point-to-point wiring, massive output transformers and power transformer. As for all Jadis’ units the PA100 is handcrafted in Villedubert in the Languedoc area. The PA100 with its comfortable power output will be able to handle any kind of speakers with ease. Wide and deep sound stage. Really pleasant on the medium, it is always a pleasure to listen good vocalize on a Jadis system, it is still the case with the PA100. Bass and treble are also perfectly transcribed. 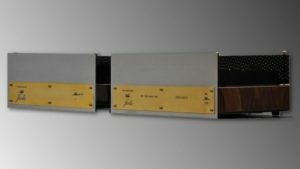 “The listening of these electronics (PA100 & PRE1) is to be remembered as one of the best that we were given to listen. 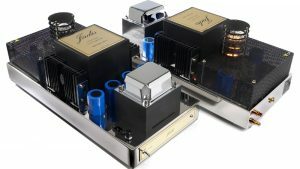 Perhaps not the most refined when compared to direct heating triode single stage configuration but still really close to it. On the other hand, they take an uncontested advantage in terms of dynamic and power output. In the end, this duo is extremely musical and lively with an impressing tonal accuracy and punch. No need to focus to unscramble the message as it gets your attention by its communicative realism”.